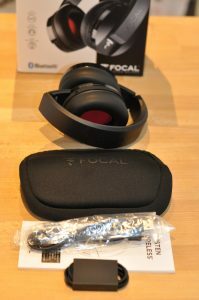 This is my review of the Focal Listen Wireless Over Ear Headphones. I’ve been walking around with these for a good couple of weeks now and they are pretty nice so let me set out why. Firstly, I walk a fair bit, so in this weather they are overpriced ear muffs but, seriously, they are ideal as a walking/talking companion. 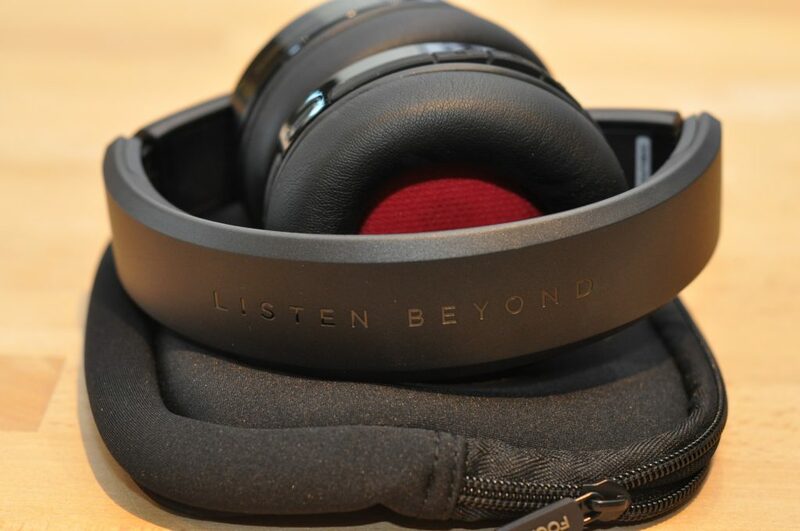 Secondly, I had a trip to London last week and it was noticeable on the train how clean looking these headphones were compared to others with clips, gaps in the band and other ghastly logos. These Focals are great and standout by the understated logo, which is preferable for me. Also interesting was the size of the Bose Quiet Comfort 35s, they’re huge. Oh, and finally, these Focal Listen Wireless headphones sound good too with aptX Bluetooth, an important point to note. 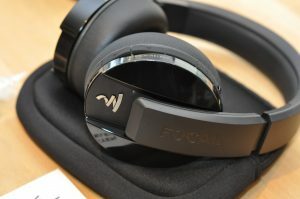 As I have mentioned, these Focal Listen Wireless headphones are ‘Over Ear Headphones’, there is no noise active cancellation here, though you can argue with a closed back design and the large ear cushions, there is a large degree of noise isolation. The key here is that you’ll be able to hear stuff that’s important, like a car coming towards you or a train announcement, if you hit the mute button anyway. 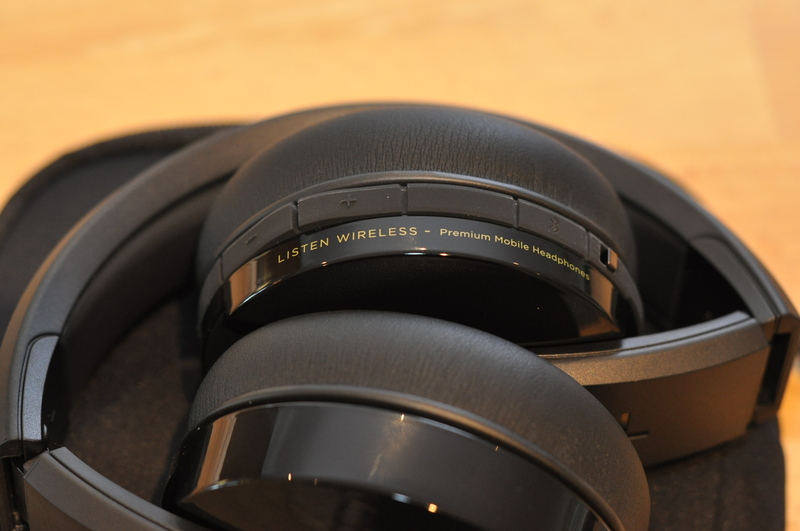 Being wireless the headphones are Bluetooth 4.1 with aptX codec. They need charging, using a USB B charger that is provided in the box. The LED changes from red to white when they’re charged and it doesn’t take that long to top them up. Focal are claiming 20 hrs of battery life which sounds about right. I’ve not run out of charge after a lot of walking. The overall material in these headphones is quite plastic, but they feel pretty good to me. The headband adjusts very easily and is comfortable, with the top of the headband having a soft feel for grip. The 22mm think cushions really do a good job of staying on your ears on the move. A good head shake has no risk attached to it. The headphones are finished in a high gloss black finish. Although these are wireless, there is a jack input (with an enclosed 3.5mm-3.5mm lead) for wired listening and a USB B charging input. Finally there are two omnidirectional microphones for ‘Clear Voice Capture’. There is a collection of rubber feel buttons on the right ear that control calls, volume and music. I have not used these much as they are very fiddly but I guess they are necessary. Overall, I’m finding these headphones very comfortable indeed. These big cushioned pads are very nice indeed. Also from a portability perspective they fold on the top band nicely into my big coat pockets. I am finding the carry case that is enclosed a bit ‘tight’ and it is rare old fiddle to get the headphones in without stretching the zip unduly. So I have ditched the pouch for general use. The headphones are a lightweight 300g or so. In the (very nice) box there is a branded carry case, a USB C-B cable and a nice detachable 3.5mm-3.5mm cable for wired use that supports the microphone set-up. I like the feel and quality on show here. The headphones are not in the same league as the Clears I had at the start of the year but overall they feel pretty nice to me. I have no sense thus far they are going to fall apart or come loose after prolonged use and being stuffed in my bag, they are still quite tight and showing no ill effects. I have been listening to the Focal Listen Wireless headphones on the move with my Nexus 6P smartphone. The phone, and the headphones have NFC connection, making the interface between them seamless and fiddling about on the move, minimal. I’ve had no issues with pairing or dropouts on the move which has been great news over these few weeks. I’ve had a few calls incoming and outgoing with the Listens and clarity my end has been very good indeed, even in windier conditions. My counterparts have expressed good words with respect to clarity of the phone calls. So it was time for a bit of concentrated, critical listening. For detail, a 24 bit recording of Radiohead’s ‘A Moon Shaped Pool’ usually does it for me although I’m never going hear it better than the wired and bi-amped Focal Utopia’s I had last year. Because I’m in Bluetooth 4.2 mode it is almost irrelevant I’m using 24 bit recordings but at least I’m used to the various nuances of the tracks I like to select. If I had aptX I would expect near CD quality on the headphones, however my Pixel 2 savings are struggling at the moment but watch the comments below for any updates on Pixels and AptX. I’m very happy with the sound of these headphones on the move. There is plenty of detail from the likes of ‘The Numbers’ and dynamically channel separation seems to be very nice indeed. I’m loving a bit of Sonny Rollins’ ‘Way Out West’ (downloaded from Tidal Masters on my phone) and the drums in the left ear with bass right sounds so crispy and clean it is a joy. In respect of tone, there is a more controlled sound here. If you have read my other Focal headphones reviews you will know that there is more controlled tight bass output from this generation of headphones. If you are looking for flappy bass then beats headphones are your game but here there is a measure of control and composure that leaves you without a blinding headaches and time to listen more to your music and relax in divine isolation. I feel the strongest area with these headphones is the midrange and vocal with the likes of London Grammar’s Hannah Reid sounding at her haunting best. I have been listening to Jeremy Bowen’s ‘Our Man in the Middle East’ Podcast, all 25 episodes. The clarity on the move is really very good indeed and walking without wires is a real joy. I’ve obviously heard a lot of Focal products in the last 12 months and all of them have their strengths. They combine to present a really high quality proposition for the serious headphones listener. On the move, for quality portability these are the ones because you are not really going to cruise down the High Street with a pair of Utopias. I prefer the closed back ‘relative isolation’ for on the move listening. I’ve always been uncomfortable with noise cancelling headphones on the move because you’re just too out of it. So at a couple of hundred pounds I think these Focal Listen Wireless are a must listen if you are on the move. For nothing, aptX HD next? The Focal Listen Wireless headphones are retailing near £200. Full details here.